In today’s modern aircraft and automobiles, there are many different surfaces, and many of them are made of rubber, vinyl, or plastic. All of these materials tend to dry out and crack as the natural oils (in the case of rubber), or plasterers (in the case of plastics or fiberglass) “leach” over time. PROTECT was designed to stop this from happening and ensure that your surfaces remain looking as good as new. In addition, unlike other treatments on the market, PROTECT has been designed to penetrate the surface it is applied to. This prevents “SLING” which occurs when products are applied to tires and then “flies off” leaving dirt spots all over your freshly cleaned automobile, which means no more dirt spots showing up behind wheel wells or down the side of the automobile. PROTECT is formulated to recondition a plethora of surfaces.Anything from plastic, fiberglass, vinyl and rubber is a candidate for PROTECT’s astounding protection and conditioning. 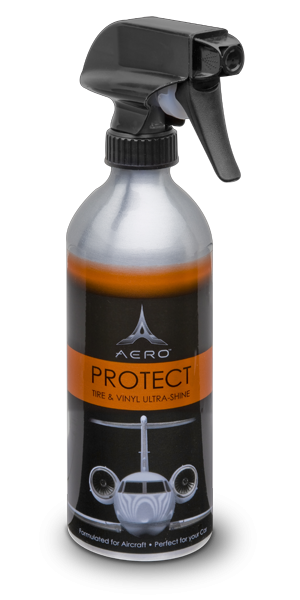 PROTECT also prohibits UV damage and other natural wear and tear from effecting the look and feel of these surfaces. 2018 International Aero Products, LLC. All Rights Reserved.